On a recent post, we discussed some live action kid's shows that may have been ill conceived, badly produced or just plain sucked and likely got someone fired (or promoted -go figure). For every live action show produced in the '70s and '80s there were dozens of animated ones that tried to compete for a time slot in the lucrative Saturday morning cartoon market. Here's a look at some that were produced based on the popularity of certain trends or other shows that basically sucked. Based on one of the all time Retro TV classics, Gilligan's Island, the ill conceived animated version had our ship wrecked crew flying through the cosmos dealing with all sorts of aliens and nutty situations. So to recap, seven castaways can't get off a desert island, only have a radio with an awesome set of batteries, need an exercise bike made out of bamboo to wash their clothes but somehow can build a rocket and careen through hyper space on space adventures. Alrightie then. Though named after the popular video game, the show really had nothing to do with the cartoon. Although it looked a lot like another car based cartoon that was pretty popular, Speed Racer, this one actually had a plot with a couple of crime fighting kids who also happened to be stunt drivers that were involved with a secret government operation. Happens all the time. What a stunt team has to do with a pole position on a racing grid, I'll never know. It only lasted one season. In 1983, Frogger the animated series made it's debut with our amphibious hero playing the role of a journalist - yup, a journalist. I suppose that answers the question as to why he was trying to get across the river - obviously there was a helluva story that needed to be written that was worth the risk of being eaten or crushed. You may have guessed that it only lasted a single season. Completing the trilogy of video game based cartoons is Q*Bert. He'd strut around the cube shaped town in a varsity jacket with a "'Q" patch (obviously) and along with his friends, constantly deal with the school bullies and their evil ways. This of course makes you think, what was he actually studying? What kind of future does a testicle shaped blob have? Again, one season. Starting to see a trend here. So what do you do when a popular kid's show is owning Saturday morning ratings? You try to duplicate the formula (or ripoff) and come up with something to rival it. So first come The Smurfs and then come The Snorks. So named for the snorkel appendage sticking out of their heads. Snorks were a race of tiny sea creatures that lived pretty much like you and me. They lived in houses, went to d drive-in movies, drive cars etc. all while under the sea. Kind of like an early Sponge Bob. Only in this case they were constantly solving problems and trying to undo some of the dastardly plots of the mayor's son who was always up to no good. This actually lasted four seasons thanks to the introduction of new bad guys to content with on a regular basis. Invented in 1974, the Rubik's Cube is still a popular puzzle thanks to the introduction to a new generation. 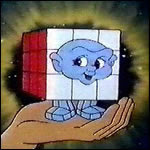 Jumping on the popularity of the Rubik's Cube craze in the '80s, "Rubik The Amazing Cube" animated series made its debut in 1983. Why they chose to give the cube an alien head, I'll never know. Really hard to believe they managed to come up with a full season of plots for a show about an animated cube shaped puzzle. Shockingly, it lasted only the single season. Who Knew That Lysol Was a Girl's Best Friend?